South African House Plans according the new SANS 10400 XA and 204. House Plans design, building or doing alterations to your home is sometimes not the best experience you can have but we will get you off to the best possible start. Our expert service and advice will make planning your dream home a breeze. We are updated on the new Energy Efficiency in Building requirements of SANS 10400 XA & SANS 204 when designing and drawing your house plans, alterations or additions. we can identify any possible non-conformity of a design in the early stages of design. This will save you money. With over 20 years combined experience in the draughting industry make us your number one choice. KMI Draughting Services offers you a complete draughting service by means of a variety of Computer Aided Design and draughting solutions for both private individuals and professional organizations. We are your greatest source for professional draughting services. Whether you need a house plan for a new addition or planning an extension to your existing property, or are you just planning your dream home and need assistance - we have the experience and the plans. We are experienced in all phases of the architectural, engineering and building industry. 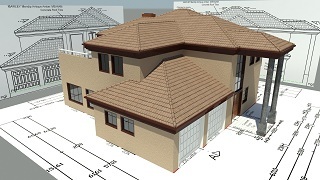 We provide a full range of draughting services including design development, building plans, house plans, construction documents, mechanical, electrical, electronic and plumbing drawings. Please click here view our services. Our experience enables us to handle the most sophisticated and complex projects but we also do cater for the smaller jobs. We take on any project or "nuisance work." No job is too small or too big - if it can be drawn, we will draw it!!! Please click here to get a quote. Proven excellence you can trust at a price you can afford. We stock the widest variety of pre drawn plans. From dwellings to garage, boundary wall plans.